Acclaimed as one of the greatest yogis of India in the late eighth century, Saraha was born into a brahmin family in Bengal, became a Buddhist monk and proceeded to become an exceptional scholar. One day he came upon four girls who offered him alcohol. They then revealed themselves to be dakinis and granted him the four empowerments, during which the Bodhisattva Ratnamati and Hayagriva appeared. From them he then received the transmission of the Mahamudra teachings. In some versions of the story, he was then expelled from the monastic order for drinking alcohol and his behaviour was brought to the attention of King Ratnapala. Saraha then underwent a series of trials to prove his innocence before the King and his court. He went on to astound them all by singing a series of spontaneous yogic songs, known as The Three Cycles of Doha. The first dohas were addressed to the King, the second to the Queen, and the third set he sang to the assembled people. These songs became famous throughout Bengal (and later the Buddhist world) and everyone was satisfied that Saraha was a true yogi. He left to wander from place to place, whereupon he came upon a woman making arrows. As soon as he saw her, all appearances took on a symbolic meaning. She also taught him Mahamudra and together they performed tantric practices in isolated charnel grounds and lonely Himalayan temples. Saraha is said to have adopted the trade of his consort; the name “Saraha” derives from his occupation as a maker of arrows, and this is often how he is depicted. 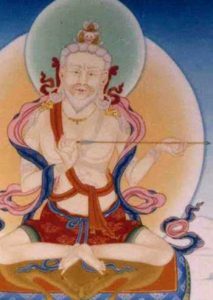 Through his dedicated practice he attained the supreme realisation of Mahamudra and spent the remainder of his life in service to others. Upon death, Saraha and his consort ascended to the blissful realm of the dakinis, without leaving physical bodies behind. From Saraha, the Kagyu Mahamudra lineage reached Marpa Lotsawa and Tibet through two main streams of transmission. One passes through his disciple Savari to Luipada, to Dengri, Vajraghanta, Kambala, Jalandhara, Krsnacarya, Vijayapada, to Tilopa and Naropa, the masters of Marpa. The other lineage comes through Saraha’s other disciple, Nagarjuna and then runs in succession through Savari to Maitripa and then to Marpa.